Warming Hut has food and drinks available for additional purchase. Great Weekend at Long Beach Open! 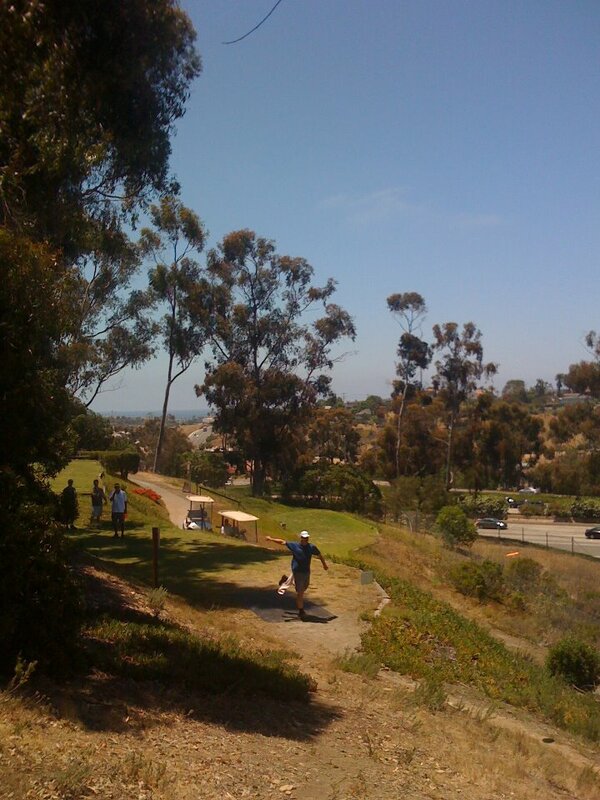 We had a great weekend hosting the West Coast Disc Golf 2012 Long Beach Open. Congratulations to the winners and new proud owners of a pair of brand new Oakley sunglasses: Men’s Open winner Steve Rico, Women’s Open winner McKayla Thomas, Masters winner Mike Bush, Women’s Masters winner Indigo Brude, Grandmasters winner Dan Henton, Senior Grandmasters winner Dennis DenDog Gordon, Legends winner Ray Carr, Mens Advanced AM winner Kyle Maddox, Advanced Masters winner Anthony Bassett, Intermediate winner Aaron Hagner, and Recreational winner Andy Tith. Would also like to thank our sponsors Legacy Discs, Innova, Gateway, Kinetic Disc Golf, and Play It Again Sports Los Alamitos. And an extra special THANK YOU to our West Coast Team for helping things run smoothly: Ryan Spohr, Davis Masey-Miller, Tommy Eckmann, Robert McIntee, Dave Pechi, Matt Spies, Robert Smith, Liam Watson, and Kory Allen. Congrats to all the winners! The large size of the field may have shaken up the points race in a few divisions. Next up….SoCal Championships @ Kit Carson and Brengle Terrace Parks in North County San Diego! DeBell Is The Newest Spot For DeDisc Golf! Alternate Shot-Doubles-Skins in the dark with the sprinklers on at a ball golf course is a crazy way to end a tournament, but if you’re Steve Rico…you gotta love it. And the extra $400 to split with your partner helps. Rico had earlier made up a three-shot deficit in the second round, firing a 1050-rated, 10-under par 54 on the 10,811 foot Goat Hill layout to take the $410 1st prize in the Men’s Open division of The Challenge @ Goat Hill in Oceanside, California. You might say he had a good afternoon. 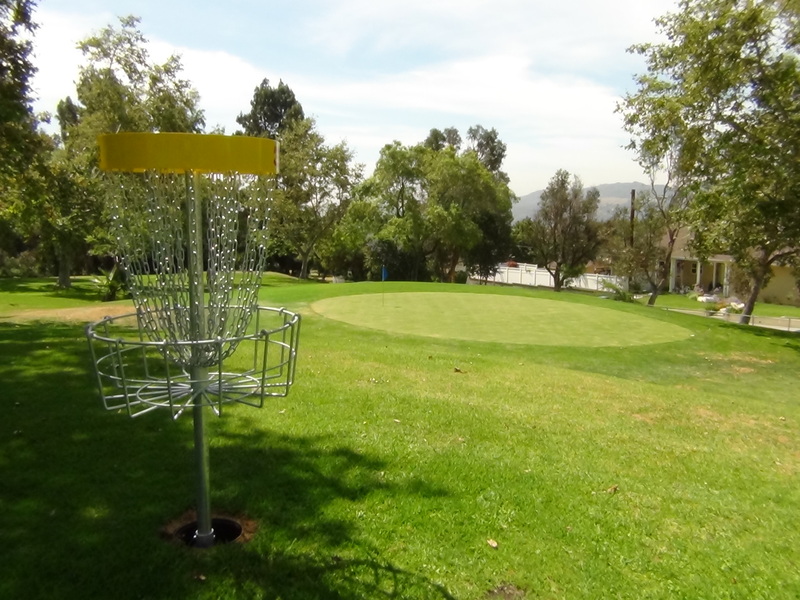 This was the second year that Bellows Golf Management, who runs Goat Hill for the City of Oceanside, hosted The Challenge – a PDGA C-tier tournament. 108 players converged on the course, playing two rounds of cart-enhanced disc golf under sunny skies and a persistent wind. Innova Disc Golf supplied great player-pack schwag while Disc Golf Values supplied beautiful Metal Flake and Blizzard tournament discs. In the Men’s Open division, local San Diegan Micah Dorius and Huntington Beach’s Jeff Spohr jumped out to an early lead with matching 6-under 57’s. Trey McKelvey was two shots back with a 59, with Rico and Philo Braithwaite lurking one stoke further back at 60. But Rico’s 2nd-round 54 was four shots better than anyone else’s score, and eclipsed the field. Brothers Max and Alex Nichols of nearby Ramona, CA rounded out the list of cashing pros in MPO. Kimmy Jones, of Phoeniz, Arizona made the trip west a successful one, by taking first place in the Open Women’s division. She battled with La Mirada’s Indigo Brude for the win, adding two strokes to her first-round one stroke lead and taking home the goat trophy. There was a tight battle in Pro Masters, where good friends Chris Brophy and Dan Duron needed two holes of sudden death before Brophy earned the title. Their final scores of 3-under were only one shot better than former World Champion Steve Wisecup (-2), followed by Las Vegas’ Jeff Jacquart (-1) and L.A.’s Rick Hoffa (E). Steve Killian rode his collection of orange discs to a two-throw win in Pro Grandmasters, besting Marcus Cisneros (+4), Jeff Nichols (+7) and Rob Wilson (+7). Three of the four amateur divisions contested required sudden-death playoffs to determine the winner. In Men’s Advanced (sponsored by SDSF Pro Shop), A.J. Risley took the lead after the first round, firing a 1010-rated 59 to take a 2-shot lead over Ethan Wellin and Steve Evans, 3 shots over Matt Hutchings, Jeremy Barnes and Patrick Paramore. Wellin’s steady play in round 2, however, allowed him to make up the deficit and force a playoff. Ethan was able to hit his birdie putt on the treacherous peninsula hole (#2) to take the win. In Men’s Intermediate (sponsored by Legacy Discs), Nick Wright won the 1st-place playoff over 1st-round leader Justin Carter, while Ben Walnum won the 3rd-place playoff over Kevin Christie. A playoff was also needed to resolve the winner of the Men’s Recreational Division (sponsored by DGA), where Wes Scheider took the title over David Phillips. Michael Brayton (+4), whose wife had secretly signed him up for the tournament as a gift, rode that high to first place in Advanced Masters (sponsored by the Las Vegas Disc Golf Club), just ahead of Paul Morgavo (+6), Bill Maury-Holmes (+8) and Anthony Bassett (+8). But the fun wasn’t over. All day long, players and spectators had been buying raffle tickets for a chance to be paired with a pro player to compete in the VooDoo Disc Golf Final 4 Challenge. Four pros were to be paired with four raffle winners (who also received VooDoo golf bags) to play four holes of alternate-shot doubles, with four $100 skins on the line. Micah Dorius and Jeff Spohr got in based on their first-round 57’s, with Rico’s 54 and Max Nichols’ 58 in the second round filling the last two spots. Even though the sun was setting, TD Allen Risley, fearing a riot (good-natured, of course), decided to let the contest go on. The four pros each pulled a raffle ticket: Micah selected Scott Beyma (MM1), Max selected Greg Arimura (MM1), Jeff picked Stephen Brown (MA3) and Steve picked…his Sylmar homie, MPO player Alex Sardelich. What happened next is not completely clear, since it was very dark. But according to the scorekeeper the four teams pushed on all four holes, finishing the last hole (Hole 18) under sprinkler fire. In the end, Rico and Sardelich took the $400 based on their overall low score. Many thanks to major sponsors Bellows Golf Management, DiscGolfValues.com and Innova Disc Golf, as well as amateur divisional sponsors: SDSF Pro Shop, Legacy Discs, DGA and the Las Vegas Disc Golf Club. Thank you also to Mark, owner of The CheeseSteak Grill, who supplied every player with a free 9” cheesesteak sandwich for lunch or dinner! The past two months have been busy around here in SoCal website-land, what with several tournaments, work, local leagues, tournament planning, disc testing, taxes…etc. So here’s a run-down of what’s been going on since we last reported to you. The guys from Oak Valley were able to put together a very nice 2-day event for Ams on the permanent Yucaipa layout. Of course, they forgot to check with Mother Nature first. Or maybe they did? Either way, players battled through a very rainy Saturday (the afternoon rain was delivered bucket-style) and contended with an Ice-Bowl-like snowy round on Sunday. Very cool (pun intended)!! Nick Newton and A.J. Risley in MA1 traded 1019-rated rounds on Saturday and coasted on Sunday to be the only two players under par for the weekend. Nick’s other Saturday round was better than A.J.’s, however, good enough to give him a 2-shot victory and his first SoCal Series event win. Noah Politzer, John Ryan and Steve Valencia rounded out the top 5 in MA1. In Advanced Masters, Roger Snider took an early lead on Saturday, show his amphibious skills Saturday afternoon with a 991-rated round (55) and cruised to victory with a 3-over total. That was eight shots ahead of second-place local Bill Maury-Holmes, two more better than third-place Jon Ventress. Dave Coffey (15-over) held off Kevin Beath (+18) for the win in Grandmasters, and Jeffrey Brown was the lone Senior Grand, and hence, the winner. Dallas “Rain and” Snow-Ramirez (+9) took advantage of his namesake weather, winning MA2 by 3 throws over Scott Miller (+12) and one more over Aaron Hagner and Chris Armacost (+13). Darrin Stewart needed the hot divisional round on Sunday morning to beat Suzette Simons for the Rec division trophy (didn’t she come from the land of snow and ice? ), and Eben Coenen won a playoff with Alexander Kaklamanos for the title in Novice. Helen Wilson (Adv. Women), Cristina Scantlin (Int. Women) and Julia Hillman (Rec Women) all beat the most difficult opponent of all (themselves) to win their respective divisions. Steve Rico is hard to beat out on tour. Put him in his own backyard, he’s near unstoppable. The April Fool’s Day Sylmar Open was another opportunity for Stevie to strut his stuff, and starting out with a 1050-rated 54 in the crazy windy conditions should have been a signal for the rest of the Open division that Stevie was playing for keeps. His 3-round total of 159 (21-under) gave him a comfortable seven throw win over Wally Moore and Bryan Vagi (166/14-under), who played well but not well enough to keep up with #4666. Rowan O’Neil was one more shot back at 13-under, while Philo Braithwaite and Paul McBeth came in at 10-under. Todd Mitchell and Jerry Goff tied for 1st in Pro Masters (9-under), four shots ahead of Mike Roberts, Steve Valencia and Dan Duron. Todd Banks (is he old enough?) was able to eke out a one shot win over Marcus Cisneros for the Grandmaster title. Sylmar had a relatively small Advanced field (8 players), but that should not detract from John Ryan’s fine win where he stayed under par for the tournament (1-under/179). John Jumped out to an early lead with the hot divisional rounds in rounds 1 and 2 and coasted in the final round for the win. A.J. Risley took his second consecutive second place at 4-over, followed by Jose Espinoza at 8-over. Roger Snider made Sylmar his fourth win in a row in Advanced Masters (oh, to be 40 again…) with a 5-over 185, three shots ahead of 2nd place Jon Ventress and three more ahead of Mark Hauser. Matt Hutchings has a PDGA# over 50,000 (50509 to be exact) and most assuredly heard calls of “Bagger!” from the other players in Intermediate as he threw three 970+ rounds and finished at 2-under 178 (psssst…he would have won MA1…). Aaron Hagner was in second at 13-over, one throw better than Sal Brambila and Josh Fisher. Karie Fisher (not of Star Wars fame, I’m told) took the Intermediate Women win over Brooke Bianchi, Michael Olivarez won Rec with a +11 and John Mascarenas won the Novice Division. The next stop on the schedule took SoCal players down to San Diego County, for the bi-polarish Ams on Saturday at Morley, Pros on Sunday at Kit Carson Spring Fling, part of the Steady Ed Series. This is the second year that Morley Course Pro Snapper Pierson and DGA-sponsored Mark Verrochi have teamed up to provide a weekend-long San Diego disc golf event in the Spring, and with very great success. Crazy weather was once again part of the story for a 2012 SoCal event, as a blustery morning round on Saturday at Morley saw a 5-way tie at 57 in the Advanced division between Michael Homan, Shane “VooDoo” Dehner, Mike Tyberg, Tracey Crowder and Justin Martinez. But on this Saturday, it was all about the second round. Morley uber-local Josh Damron and SLO youngster Peter McBride smoked the course with a pair of 1020-rated 53’s on the way to a 1-2 finish. Big Josh was the only player under par at Morley on Saturday (1-under) and took the MA1 win and a shiny new basket. Peter took second at 1-over, while Homan slipped to 3rd at 2-over. LA Steve Valencia, A.J. Risley and Misters Dehner and Tyberg tied for fourth, and were last seen sorting out their prize bags. Kim Cottrell took the win in Advanced Women on the wings of a 912-rated 66 in the first round, holding off a late-charging Shonda Garcia. Did we mention that Dan Shorkey had a good weekend? It started on Saturday with a seven-throw win over second-place Steve Fawcett in Advanced Masters. Dan put together 992 and 984-rated rounds and had the second-best score of the day for all divisions at even par. Dan also took home a nice new basket courtesy of Snapper Pierson. Local thespian Paul Morgavo finished in 3rd at 11-over, Anthony Bassett and Tom Millard tied for 4th at 13-over and Roger Snider finished 6th (14-over), ending his string of MM1 victories. Mark Hauser had the best score both rounds amongst the Grandmasters to finish in 1st at 9-over, followed by local Christian Cullen in 2nd at 13-over. Ben Neely also had the best scores both rounds in his division (61/957 and 59/965) , which therefore led to his win in Intermediate at 6-over par. Daniel Vega was two shots back to take second place. Chris Armacost, Taylor Mate, Paul DesMarais and Brian Vallance tied for 3rd. Chad “Tomahawk” Nichter played way above his rating (883) in winning the Rec division, with consistent rounds of 62 (948-rated) and 61 (947). He beat Chris Goodrich (13-over) by 4 and the 3rd-place pair of William Cooper and James Barnes by nine. 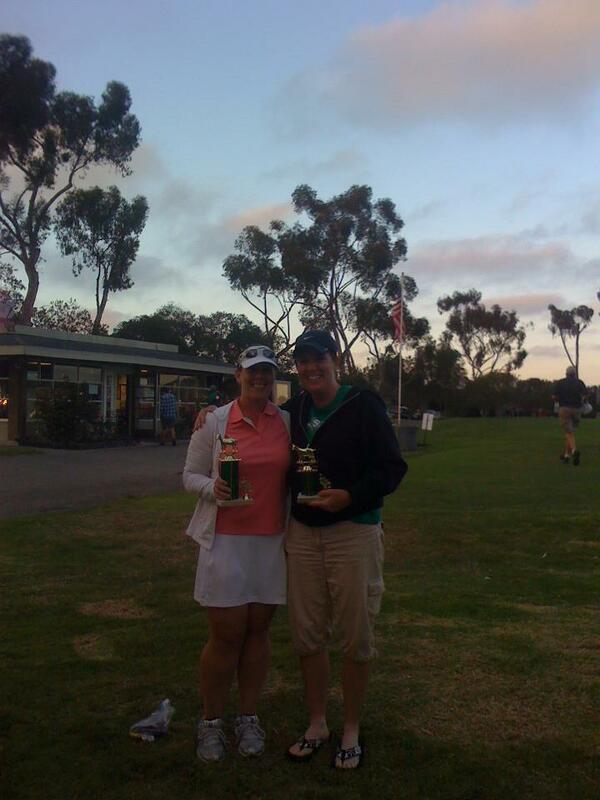 Shannon Wylot braved the elements to take Saturday’s Junior division title. For some strange reason, pro disc golf events have a hard time filling up in San Diego. Maybe it’s because Micah Dorius lives down here? No matter – TD Mark Verrochi had a plan for filling the field: add a trophy-only option! The result was an Open field of 59 players and a tidy payout of $600 to winner (who else?) Micah Dorius. Micah had identical rounds of 49 (and was the only player to shoot under 50 both rounds) on the way to a 12-under total of 98, one shot better than up-and-comer Max Nichols in 2nd place. Steve Rico came down south from Sylmar to capture 3rd (9-under) and Mike Lust had an impressive showing with two 1000+-rated rounds on his way to 4th (8-under). There was some grumbling out on the course from pros who were frustrated with the heavy pedestrian traffic and the inexperience shown by some trophy-only players, but it provided a great payout for the winners and a great experience for these newer players. Kim Cottrell made it two wins in two days by taking the Open Women title over Cristina Scantlin, and Allison Wylot walked away with the Masters Women title. And don’t forget about Dan! Dan Shorkey also made it two-for-two for the weekend, running away with the Masters division title by eight strokes (7-under) over Paul Morgavo (1-over). These two guys were playing trophy-only, so the cash payout fell to 3rd-place Todd Mitchell (4-over) and 4th-place Mike Westerman (also 4-over). Shorkey also had the best score for the day amongst all trophy-only players, which earned him another little golden basket trophy (and I think a new full-size basket?). The Grandmasters division was hotly-contested, with Marcus Cisneros and Greg Olsen tying for first at 2-over. Greg conceded the win to Marcus, who got both the trophy and $195. Tied for third two strokes back were Randy Wylot, Steve Killian and Allen Risley. Perennial San Diego Pro Glenn Triemstra jumped out to a big lead in the first round and held on to win the Senior Grandmasters division with a 2-over total, besting upside-down guru Tom Clickner (9-over). Phil Ganshert, who had the lowest PDGA# of the day (777) took last cash in an oldest dude division that was larger (8 players) than the older dude division (7 Grandmasters) and old dude division (7 Masters). Let’s hear it for the Senior Grands! We have a few more weeks before our next SoCal event, the Pro/Am Fling XVI at Chavez Ridge, but don’t wait to long to sign up – events have been filling this year! In the meantime, there are some interesting non-SoCal things coming up (Cinco de Mayo at La Quinta May 5th, Verdugo ball/disc golf doubles on May 6th and the Women’s Worldwide event at various courses on May 12th) along with the usual collection of local monthlies and weeklies. Check out the “Courses” page on the SoCal website for info on these local events and keep your eyes on the SoCal Disc Golf Association Facebook page for other random stuff that comes up. And June will be hoppin’, with the Cannonball Run, Evergreen Open and Challenge @ Goat Hill on the horizon.